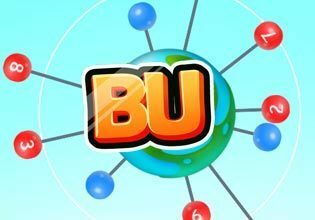 BU is the successor to the fast paced arcade game BB. It is still all about perfect timing and great strategizing skills at the same time. The objective of the game has changed a bit in order to make the game-play a bit more complex: Stick a given number of pins in a revolving orb and make sure that the heads of the pins don't get in contact with the other pins' heads. The orb now got a ring whose distance varies constantly! The distance of the ring around the Orb will determine how far your pins will stick out of the Orb. This means you can now place several pins in the same place! Play BU now and showcase your precision and focus in 75 fantastic levels!